I’m no expert in setting up or running the Team Associated RC10, nor was I ever a competitive racer in any organized racing events. Variant: #6010 Complete Kit, “Edinger” (probably mid-late). #6010 “Complete Kit”. This was (in my opinion) the most standard spec kit, with all the standard equipment you would expect in any other R/C kit of the day (e.g. Tamiya). #6000 “Basic Kit”. Difference: Same as #6010 but with no electrical components included. #6012 “Complete Kit”. Difference: Same as #6010 but with no body or wing included. #6016 “Complete Kit”. Difference: Same as #6010 but with ball bearings instead of standard bearings. #6020 “Complete Kit”). Difference: Same as #6010 but with a battery pack added. “Edinger” – Earlier vintage kits are identifiable by having Team Associated’s earlier 1928 East Edinger Ave in Santa Ana California address on the box (hence the nickname). These date from 1984 – 1986. There were many other gradual changes during the Edinger era. “Cadillac” – Later vintage kits are identifiable by having Team Associated’s later 3585 Cadillac Ave Costa Mesa California address on the box (hence the nickname). These date from 1987 onward. There were many other gradual changes during the Cadillac era. The RC10 was designed with a focus on racing, and as such, underwent an unusually high number of parts changes and performance tweaks during it’s production, leaving us with a complicated history of variants. The most informative resource for many of the differences, broken down roughly into “Edinger” vs “Cadillac” (and “early” vs “later” within each) can be found in this RC10Talk Forum Thread. Team Associated RC10 Classic. 2013 remake with new model number. Sold by Team Associated now under ownership of Taiwanese company Thunder Tiger. Kit is made with mostly new molds, new tooling, new materials, and a mix of parts from China and the USA. And there are definitely other, more comprehensive pages on the web about the RC10, than this one. But I’d still like to talk about why it appeals to me, as someone who sees it more through a prism of “phenomenal toys of the 80s”, than from racing experience. Like many kids growing up in the 80s with a fascination for toy cars, if I was lucky enough to even see a car like an RC10, it would probably have been high up on a hobby shop shelf – well out of my reach physically, financially, and in terms of kit-building ability. And I can still remember those hobby shop visits, when I was somewhere between 7 and 11 years of age, gazing in awe at items like this… wondering when I’d be old enough to afford or build such things. Even though this particular R/C buggy was mostly the preserve of the dedicated R/C racing community in the 1980s, I’ve always felt that it came from an era in which most R/C cars were still being designed to appeal to anyone – from little kids staring up at them in hobby shops, to experienced scale model kit builders, to the racing pros at the track. In 1985, the RC10 finished first, second and third at the first ever 1/10 electric off-road World Championships, in the ‘stock’ (unmodified) category. This car was a highly competitive, well-made, and still beautiful buggy that was, to put it simply, years ahead of it’s time in competitive circles. What I like most about the RC10, is that it was both a racing thoroughbred and a nice scale model that looks a lot like the real VW-powered sand-rail buggies that were scooting across dunes in the USA back in the 1970s and 80s. The world of competitive R/C racing actually began to forgo scale realism for the sake of better performance as it grew in popularity in the 1980s. Visual details like driver figures, scale window netting, headlights and so on were eventually dispatched to save weight and improve aerodynamics, as organized racing became more serious and more expensive. Sadly, this drove most R/C buggy design toward sleeker, more featureless shapes with little realism and few parallels among full scale cars. But back in 1984 at the time of the RC10’s release, the R/C racing world was still somewhat in the middle of this transition – scale-model realism was still a little bit relevant (in the early 80s, some local racing clubs even insisted that all entrant cars must carry a driver figure on-board as this was seen as a basic requirement of miniature model car racing!). This was also a time when Japanese company Tamiya was the most popular hobby-grade manufacturer. Their realistic models with beautiful body designs were still the favoured brand of most kids, home hobbyists, and club racers. So it’s fair to say the RC10’s scale looks were a product of an era when the general thinking was that all these cars, even the ones designed for racing, still needed to look quite real. Most of the cars on the market now were designed for fun or to look realistic. The RC10 was designed to look realistic, but it’s designed for racing too. 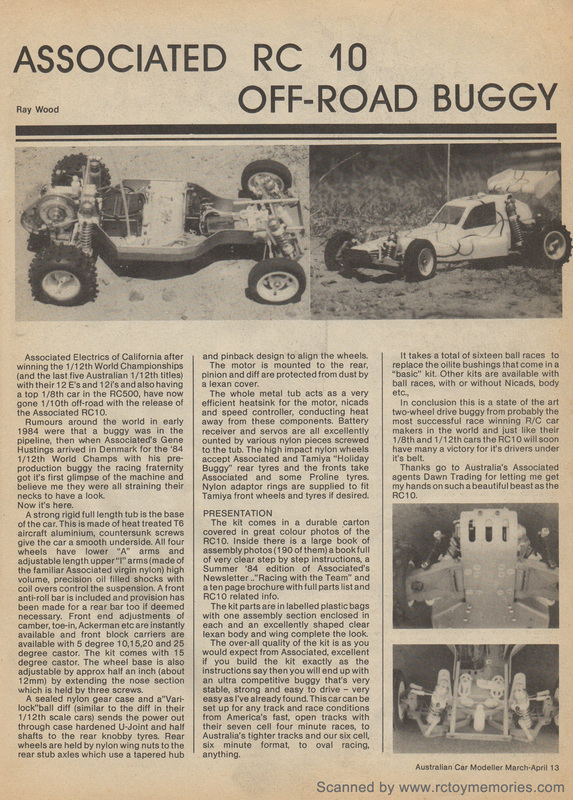 Roger Curtis had even visited events for full scale off-road buggies while scoping out his engineering plans for this model, in an effort to align his design thinking with some successful applications in the real buggy racing world. And whatever insights this experience gave him, they seemed to translate very well into performance at 1/10 scale. It’s always a bit of a treat when there’s some official promotional footage leftover from the 1980s for a particular toy – like a TV commercial or shop promo. In the case of the RC10, Team Associated actually released a 30 minute tape about the car called “The Winning Edge With RC-10’s” [sic]. The film comprises technical info about the car, scenes of an RC10 scooting around a beach (set to cheesy 80s rock music of course), and then some racing tips. But it’s an absolute must-watch because it’s both pure 1980s gold, as well as the fact that all the info is presented by the key players in the RC10 story, including Roger Curtis himself. 6 prototypes were initially made. The first of which was mostly hammered out by hand. The car’s transmission was kept low at the rear specifically to ensure the driveshafts weren’t angled downward when the car sits, for a more efficient transfer of power to the wheels. While Roger Curtis designed the chassis, the body and wheels were whipped up by Gene Husting “to save time”. In the days before racing categories were officially separated into 2WD and 4WD classes, the RC10 was often raced against the new-fangled 4WD vehicles – yet would still often beat them. And here’s Part 2, Part 3, Part 4 and Part 5 of the film. The kit shown here is one I found at a hobby shop in California that closed down some years ago. The owner had passed away, and a new owner was selling off all the old stock in the store. This kit had been out the back on a shelf – untouched for almost 30 years. Since the RC10 was designed and manufactured in California, I’m not sure if I can think of a more authentic way to come across an original RC10 – still sitting in a shop in California, not too far from where it was manufactured, and not too far from the desert Baja events that inspired its design. This kit is also what collectors call an “Edinger” version of the kit – which just means it was made when Team Associated were based at “1928 East Edinger Ave, Santa Ana. California” – their first address, which is printed on the side of the box. As the car became a huge success, Team Associated’s production volume grew and they moved to larger premises – so their address changed to “3585 Cadillac Ave, Costa Mesa, California”. Thus kits with that address on the side are commonly referred to by fans as the “Cadillac” version. The box art is really one of the great aspects of collecting old R/C cars (or any old toy really! ), and in this case it could hardly be better. The RC10 box was designed by the late Chris Chan. And the car on the box is one of the original prototype RC10s. I also love the text wrapped around clear figure shots of car on the box sides. It’s all very easy to read and eye-catching – really excellent marketing. The front photo showing the car “leaping” over dirt ground with the wheels in full spin, has become one of the most famous photographs in R/C model history. At least in my opinion. As mentioned, the car’s body and wheels were designed by Gene Hustings, and he did a really great Tamiya-esque job with the well-proportioned body style and driver figure. The little details like headlights and window-netting give it plenty of life-like character. I also really love the orange paint scheme and simple, retro stripe pattern, and big “10” on the bonnet. This is what racing cars often looked like back then – simple, elegant racing colours and logos. None of that tacky “flame” sticker crap you see on a lot of R/C toys these days. …but it still offers a nice reference because a lot of people are very keen to restore their RC10s to the exact box art look. Another iconic element in the RC10’s construction is of course it’s gold chassis – a light, but rigid piece shaped like a bathtub and made from anodized aluminium that both aided performance and had the side effect of giving the model an expensive look. You often see the car referred to by this component alone as the “gold pan” RC10. Also noteworthy are the equally golden shock absorbers – which were a revelation for their time. Prior to this car, oil-filled damper shocks had been in use in 1/10 scale R/C buggies, but they were generally narrower and often had issues with leaking. 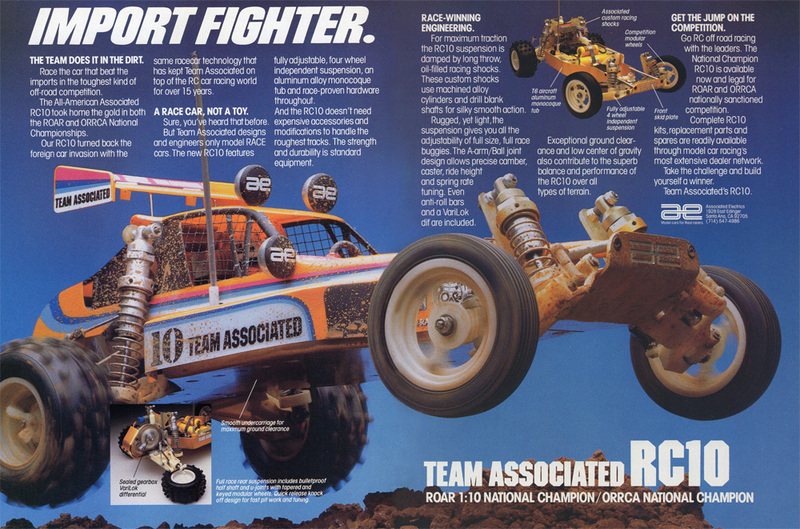 The RC10 shocks were perhaps the first really professional shock absorbers on a 1/10th scale R/C model, and it was possible to tune them (with the right oil) to prevent bounce and enable the car to really hug the ground over rough terrain and jumps better than any competitor. There’s one slight complication to collecting the RC10 however. The original kit was tweaked and modified throughout it’s production run, meaning that if you care about small details, you will find there were a large number of variations in the kit over the years from the tyres to the chassis to just about everything else. Most of these tweaks are minor, but if you want to learn about all of them properly, look no further than this sticky thread on the RC10Talk community forum which goes into immense detail about how the kit was adjusted. There are some aspects of the car shown on the box art that are not easy to recreate precisely – even when you build the model from the original kit. For example, the chassis shown on the box is an earlier type with a lighter gold colour to it, while later in it’s production run the gold chassis ended up being a richer, deeper orange-gold. The most annoying thing to me though, is the decals – as the original kit doesn’t even include all the ones used by the car on the box. 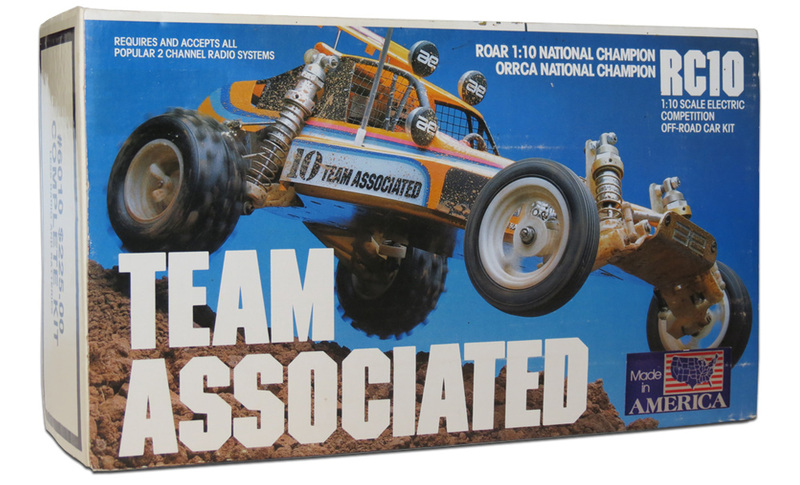 Which was a sign that Team Associated didn’t really think anyone would obsess over the look of their box picture car that much. How little they knew! 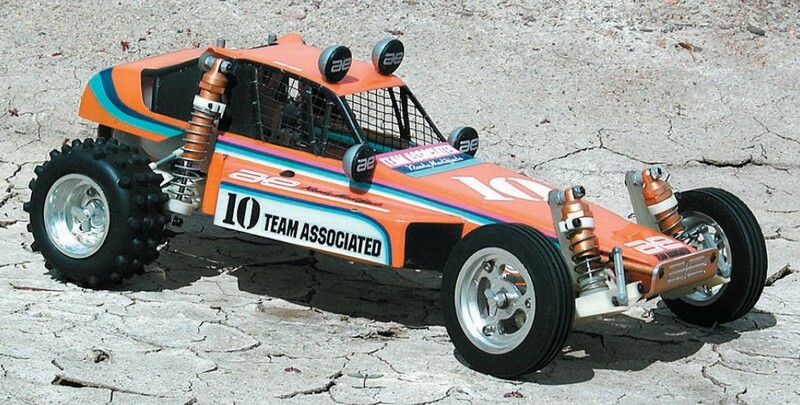 In 2013, Team Associated announced they would be releasing a remake of the RC10 kit and calling it the “RC10 Classic“, obviously in response to the huge nostalgia for this model. Team Associated is now owned by Taiwanese company Thunder Tiger, and the RC10 Classic is made with mostly new molds, new tooling, new materials, and of course a mix of parts made in China vs the USA – so inevitably it has differences to the original, including the absence of that shiny “Made in America” sticker on the front of the box. But it’s nice to see that someone from the company has been up-front in helping create a list of all the differences so that people can work out how they want to approach building the new kit. …not devalue current collectable RC10s, and we tried to make sure that there were ways of identifying new parts from old parts. – Tim Tunnermann, Team Associated. Since most of the tooling used to create the original RC10 was actually lost, broken or discarded many years ago, all molded parts of the RC10 Classic had to be created with new molds, and many intentional changes were made to the parts to make it even easier to distinguish the remake from the original car and help protect the collector’s market. One undeniably good thing about the RC10 Classic is that the decal sheet included with it is very helpful in recreating that famous box picture look. The sheet is still not 100% exact, but it does offer a number of decals that were actually never included on the original kit’s decal sheet from the 1980s. Thus, if you’re building or restoring an original, it’s worth grabbing the new RC10 Classic decal sheet – especially seeing as there was never an official original decal set that could achieve the box art look. It’s a more faithful thing to do than using some amateur repro decals, and let’s face it, Team Associated really should have provided a more complete decal sheet with the original kit in the first place. The RC10 Classic kit has since proven to be a short-lived tribute kit, which is now becoming harder to find itself. Though of course, nowhere near as hard to find as a mint original RC10. I’ve written a fair bit here, and yet there’s so much more that could be said about such a revered and successful R/C toy buggy, some of which I am not really qualified to blather about (since I was never a racer, and am still no expert). But before anyone flames me for using that word “toy”, I’ll wrap-up by expressing why the RC10 is here on R/C Toy Memories in the first place… and it’s because I think the RC10 was just as a much a super cool car that any kid would have wanted to play with in the 1980s, as it was a game-changing competition machine. And I know that some lucky kids did own them purely to run for fun – whether backyard racing or chasing cats down the street. So if you did, or know anyone who did, it’d be great to hear your memories of the RC10 in the comments section below. Including whether any cats were fast enough to escape. Another point to mention is the fact that the RC10 spawned a whole family of vehicles with the ‘RC10’ name, from special competition edition buggies, to trucks and more. Hence everyone refers to this first one as the “original RC10”. While all of the others have their fans and collectors as well, personally I feel that each successive model had a slightly less realistic look and that this left the original looking the best in the series. Combine that with it’s historical significance, and today you have an extremely collectible R/C model which, as always, is most desired in new in box or at least mint, condition. And since demand will always be strong for such a famous model, expect the values of unbuilt original kits and mint car to continue to climb well into the future. I enjoyed this article – thanks for taking the time to do it. I’ve seen the re-release for sale at a local hobby shop and it looks very cool. Great article – I really enjoyed reading it. I myself had a original rc10 back in 1987 I was 13 years old at the time my mother bought it for me at a local hobby store. I actually put this kit together myself and I took it to the local track one saterday and they where having tractor pulls well I entered my rc10 and won several pulls this car never failed me. Well anyway after a couple of hours of having fun with this car the pulls where almost over and this older kid I would say he was about 16 years old was driving this very fast carbon fiber car with no body on it up and down the parking lot I never seen a car go so fast as his did before. So I was watching him drive it and he started talking to me about my car that I only owned for 1 week and said my car was really cool and I told him his car was awesome and fast so anyway he asked me if I would be interested in trading him I said wow you really want to trade me that fast car for my stock rc10 he said yes I said sure well he said that he would like to keep his battery and speed control I said sure so he did a quick switch on electronics and he left. So mean while I was driving this car on the parking lot when all of a sudden it stopped working and the electronics where smoking I took the car into the hobby store and they laughed at me and said the kid that owned this car put odd parts into it and that it was not a real made rc car. I was very upset and so was my mother when I got home I never did get another rc car until I was able to purchase one on my own. Now that I am 39 years old now I bought a release Rc10 it was very hard to get and I do not plan on putting it together I plan on building a display case and leave it in the box with the factory seal. I will always treasure this car and look at it and say to myself this car is never going anywhere ever again! Amazing story Rick – I really sympathise! I too made a few “trades” in my childhood that I later wished I had never done. Glad to hear the new RC10 Classic will make up for disappointment of your first one. Thanks for sharing! That is a bummer of a story. Thankfully I was on the “other” end of an RC10 trade where I received one for a Varicom Big Grizzly that I didn’t like. I still have that RC10 today! I always had a love/hate with the RC10 back in the day. That famous two page spread in the RC magazines of the original RC10 doing that iconic leap was an awesome bit of photography (so much so that AE used similar shots for the subsequent versions of the buggy). But…it wasn’t a Tamiya and I was (and still am) a Tamiya diehard. The RC10 ended the days of seeing Super Champs or Scorpions tearing it up on the tracks. Even the Frogs which had proven to be so popular the year before were hard pressed to compete against the dominance of the RC10. To me, the RC10 lacked all the neat marketing features Tamiya buggies were known for. The name seemed bland and although the box shot was awesome, I was hooked on Tamiya’s classic big white box with fantastic artwork. The kit didn’t just fall together like a Tamiya kit either. The transmission in particular required a good bit of work to get it running smoothly. This was how I felt 30 years ago. Today is a different story. In hindsight the time it took to properly setup an RC10 was time well spent. When completed, you had a tightly fitted fine racing machine that still had some realism in it. 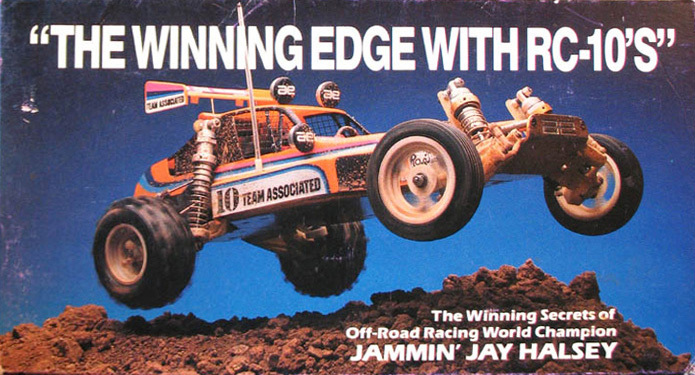 Tamiya cars may have gone together easily but from a competitive standpoint, they were full of slop in comparison. The RC10 was a clear break in design theory and set the tone for 2wd competition for decades to come. It was truly a landmark buggy. Seeing how AE set about designing the car in the “Winning Edge” video is a real treat. So, I suppose its safe to safe my opinion of the original RC10 has done a 180. So much so, that an RC10 is the ONLY non-Tamiya vehicle in my hobby-grade collection. Great article. I have 3 of them myself. After 20 years my son has taken one of them to the local club track to run laps around all the newer buggys. The look on people’s faces is priceless. One of the best things to come out of the 80’s for sure! Great review of a ground breaking car. Your article rings true with my because I remember looking up in my local hobby shop at the RC10s on the shelf and knowing that it was too expensive for me. I used to covet that iconic photoshot in magazines and dream of the day I could get my hands on one. Then 2 of my friends each got one and my poor Hornet wasn’t the baddest car on the block any more. In the end, I ended up getting both of their RC10s off of them and I still have one today! I added another RC10 to it and I also have an RC10T where the “T” stood for “Truck” since it had wider suspension to accommodate bigger tires so people could compete in the truck racing. I have owned multiple versions of the RC10 over the years starting with one of the original kits with bushings and the resistor bar mechanical speed control through the Champ, Graphite and Worlds. I still have my original 1985 Gold Tub with a newly painted body replicating the box art as a shelf queen and have bought and built one of the RC-10 Classics to be a runner. Back in the day, I occasionally raced my RC-10 both off road and indoor on a carpet oval with improvised ramp jumps when the snow was falling in Illinois. It was always fun to drive and was competitive. My RC10 Classic runner I am driving now is running a 17.5 turn brushless with novak ESC and I have been able to run at the local hobbyshop’s track and keep up with newer Kyosho, Losi and Associated B4s with it. Driving it takes me back to the late 80’s/early 90’s. I have a copy of the Winning Edge video and have watched it many, many times over the years. the rouse Hill RC track in western sydney. It had its own RC hobby store as well If i remember right.? Cheers Bijan! Fantastic that you found an original RC10 with the original mechanical speed control included. That home video – wow. And a Wild Willy, Hornet, Kyosho Optima….fantastic gifts, and incredible 1980s memories I’m sure mate, well done. And good on your Dad for being so diligent with the home movie camera (my Dad was quite similar). Thanks for the nice comments, I’m really enjoying your site! It has to be one of the most comprehensive RC sites on the web and your writing is extremely eloquent and interesting to read! Collecting vintage RC cars has to be one of the most niche’ hobbies out there but I’m very nostalgic at heart and I have such good memories as a child growing up. (thanks to my dad mostly) It’s funny but every year around Christmas time I find myself looking at old vintage RC stuff, I guess it’s this time of year that brings back the most memories. I got back in the hobby about 6 years ago and primarily fly RC helicopters and airplanes, I’m one of the rare hobbyists that still fly glow planes and helicopters as well as the electric stuff, again the nitro characteristics of noise, smell and smoke are very nostalgic to me. Quick question, what are your thoughts on Kyosho re-releasing the Optima? Is this plausible? Great collection you have going, and thanks very much for the kind words – much appreciated. You’re right about the Wild Willy too. I believe yours is in fact the Wild Willy 2, and it really is very different to the original Wild Willy. But as you stay, still a great looking vehicle. I also know the Hobby Lobby Hunter you mention. My personal opinion is that it is highly likely Kyosho will reissue more cars, particularly the Optima. The Optima, the Ultima, the Javelin, the Turbo Scorpion would all seem to be highly likely. As would others in the lengthy Optima series. All of their reissues are entirely new kits too, using new molds, and containing many changes to the originals. The original molds for many of their cars were in fact, according to many, destroyed or lost many years ago. Hence the new ones are being recreated mostly from scratch, and manufactured in China (instead of Japan). Tamiya is fast running out of popular vintage kits to reissue, and all of their reissues have carried plenty of differences as well, and in some cases, vast differences. So technically speaking, all reissues actually qualify as whole new “Models” (to wit, they all have new model numbers as well). Some of the originals are quite rare and expensive. But then, one original might equal (depending on the car) the cost of buying between 2 to 4 reissues. Ultimately, it may be a question of which will simply give you the most satisfaction – owning several easy-to-find reissued kits. Or owning one or two originals (the exact cars you had, in the 1980s). When the reissues first started to happen, I bought them. But I later realized they didn’t mean the same thing to me, and that I would rather save that money toward buying originals. I have not looked back since. I just read this story and I would like to say that I got an original “GOLD PAN” rc 10 in 1986. I raced it in the states and then joined the ARMY in 1987. I raced that same car in Germany when I converted it to a “wheel” controller and electronic speed controller. …guess what I still have it to this day. I still race rc but now I run the B5M factory team ‘LIGHT”. and a team LOSI 22 3.0. I have had many different cars over the years like Tamiya, Kyosho, and Losi..but I never got rid of that RC10…I look at it and just can’t part with it…. So now I am updating all of the electronics and am going to run it..not race it but run it…. Just found this site, love it! Great article! 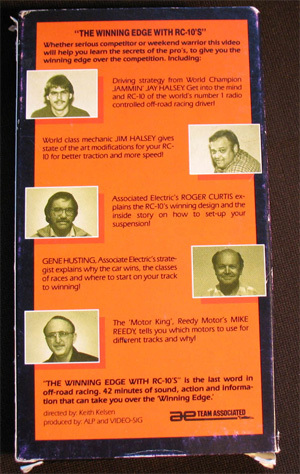 I remember poring over the rc catalogs in 1985 trying to decide which RC I should purchase. The RC10 confused me because I really had no good knowledge of it. 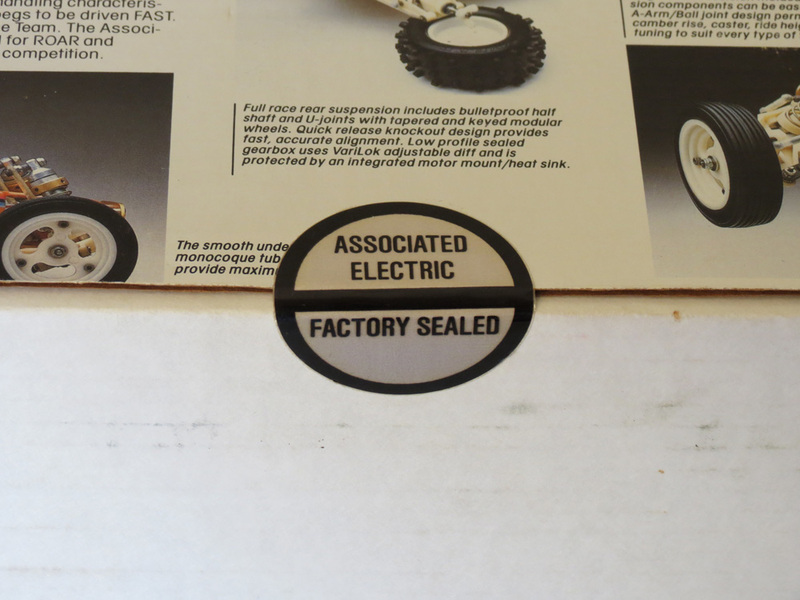 It came with a speed control (no reverse), without a speed control, etc. I ended up with a Hornet which was a perfect 1st car. I eventually worked at a hobby store in the late 80’s and ended up with an RC10. I no longer have it. I wish I hadn’t missed the boat on the RC10 classic though. Cheers CSP 🙂 Yeah, the RC10 was already offering that sense of “BYO equipment” even in 1984, due to being aimed at racers. And beginners were in for disappointment if they bought one of the non-complete RC10 kits without realizing. But at least there was the “complete kit” edition that had a Tamiya-style array of standard inclusions to get you going. There’s no doubt that the Tamiya kits were the standard-bearers when it came to hassle-free kit-based cars. And I think you did the right thing getting a Hornet first. And you’re right, the 2013 “RC10 Classic” Chinese/US reissue ended up being a limited reissue that’s now out of print I think, causing even it’s value to creep north a little since then. While the value of the original 1980s USA-made kit remains far higher, and can really only climb in future given the limited number of surviving originals in new in box or new-built condition. I have a 1985 Monogram Thunder 1/10 scale Radio Controlled off-road race set. 6702 deluxe set. In looking to see if it holds any value before allowing my son to play with it. Anything vintage (1980s) like that, holds value Johnny – though the actual value will depend on condition. What you have is a car that was made by Yonezawa of Japan, and rebranded Monogram in the US. Definitely remembered by many, so if it’s in mint condition I might hesitate to let it get ruined… but if your boy is very careful with it, there’d be no harm in letting him create his own memories. I owned the 4th prototype of the RC10. I wish I still had it. I was living in Santa Maria, CA and my step dad and I found a local track. Actually it was a BMX track that one day a week was reserved for off road RC racing. I believe I had a car called the Grasshopper or something. Some middle aged guy was there with his RC10 and I loved it! It was so fast and far outperformed my entry level car. My step dad and I became friends with him and he “gave me” his RC10. Maybe he sold it to me for $100. I can’t quite remember. He said he had a few cars and wouldn’t mind me having one. His story was that his son-in-law (or soon to be son-in-law) was one of the Team Associated team drivers. I can’t remember his name. Maybe Losi? But the RC10 that he gave me was originally the son-in-law’s car that he had raced and was one of the original prototypes. When I got the car, several of the parts were either engraved or Sharpied #4. When I asked the guy about it, he said that there were 6 prototypes and this was the 4th one. The guy was super nice and ended up taking me and a friend to a few races up and down the coast of California. I had the car for a few years before high school sports consumed me and I lost interest in RC cars. But I now wish I still had that car.